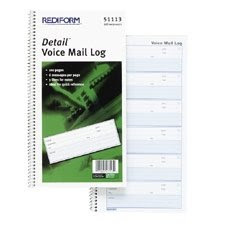 I've been using a voice mail log book for a couple of years now and like you, it's made a huge difference. I don't get near as many voice mails as you do, but I like that I can look back through it to find previous information. I also use it to jot notes when I'm talking on the phone. The one I use is from TOPS, which is available from Corporate Express if anyone has a contract with them. I don't really have a different suggestion, but a supplemental one. The book Getting Things Done by David Allen takes a really simple (but amazingly effective) approach to organizing all your incoming stuff which would apply to voicemail The email management tips from this book have made a huge difference in my world. The paper-based office solution that I can't live without is my calendar. I have a Google Calendar and a calendar in Outlook, but I love my paper calendar. It lays out my entire week at a glance, with hourly slots so I can track appointments and stuff. If it's not on my calendar, it doesn't get done! Eventually, I do make sure everything gets into the Outlook calendar, but it usually starts on the paper one.